It is supposedly one of four Ojibway communities located around Qu'Appelle Lakes. Qu'Appelle is pronounced as "Qu-Pel." Below is an 1893 map of Piapot Reserve. However, late 19th century and early 20th century maps, don't show Piapot adjacent to Muscowpetung. That's because Piapot is located at Last Mountains Range which is located 35.6 kilometers or 22.1 miles northwest of Qu'Appelle Lakes Reserve. 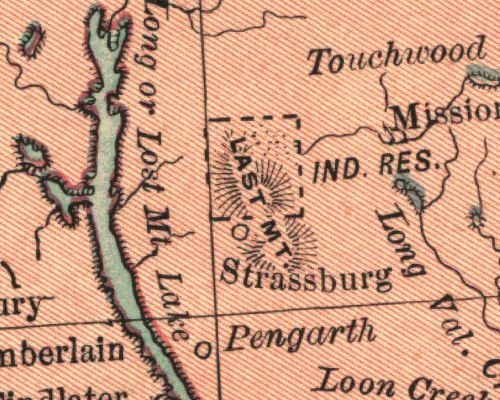 You'll notice that, on that 1893 map. Chief Piapot was a defiant leader who probably joined 1885's Northwest Rebellion. His Reserve was possibly attacked by white Soldiers or chief Piapot led his subjects to Montana. Today, Piapots First Nation or Reserve, has been forgotten. However, we know from late 19th century and early 20th century maps, that there was an Indian Reserve located at them Last Mountains Range or Lost Mountains Range. Strasbourg is adjacent to Piapots Reserve on it's south. There is one white community within this Reserve. According to a book titled "Lost Harvests: Prairie Indian Reserve Farmers and Government Policy," chief Piapot was offered a Reserve at Last Mountain yet refused. We know that's a lie. He supposedly wanted land with running water where fish could be found. His demand for running water was for wild rice lakes. Not for fish. Ojibway People created wild rice lakes where climate conditions allowed it. Word for Reservoir in Ojibway is "Za-ga-i-gan." Word for lake is "Ga-mi." Though his reserve was small, it has many lakes which means chief Piapots subjects had a source for food including wild fowl. Wild Rice was far more important to Ojibway People in that location, in those times. According to that same book, chief Piapot wanted his Reserve west of and adjacent to Muscowpetung's, near Pasqua's on Qu'Appelle River. East of Piapots Reserve is Gordon-Muskowekwan (Mus-skow-i-gan) Reserve which means them whites lied. Piapot, Gordon-Muskowekwan and Day Star-Kawacatoose Reserves are a same Reserve. Incredible numbers of lakes are located in that region. At this time, whites are planting trees around and in those lakes to dry them up. We will refer to this Reserve as Touchwood Hills Reserve. It includes Day Star, Kawacatoose (Ka-woc-ca-tos), Mus-kow-i-gan, Gordon and Piapot.